Well, transfers has come around again. 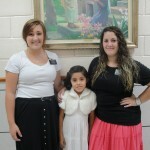 Hermana Rodriguez will be in her house and I will keep on keeping on here in Juayua. I am really sad that she will be leaving me, I love her so much. She truly taught me how to enjoy my mission. Not a day went by where we did not laugh. 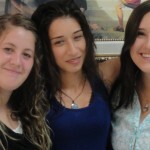 She has been an amazing companion, and will be an amazing friend forever… (how else am I going to be able to go to Spain? Anyways, to this week….. Wow. Where do I begin? So many crazy things happened. I was a little mal de salud the first couple days, but I had a great chance to do some personal study and to reflect on the little blessings in life. There really are so many. On Wednesday we had another Baptism! Meet Daniela. She turned 8 on Tuesday and is such a sweetheart. We have been teaching her and her parents. 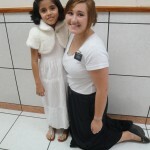 They have received the missionaries for years and finally their daughter was able to be baptized. The spirit we felt was so strong, I love her so much. A lot of people came to support too… SO awesome! I honestly just don’t even have words. She is such a great example for her family. In the baptism her mother shared her testimony and there was not a dry eye in the whole room. On Saturday there was another tender mercy from the Lord. Remember a couple weeks ago, when we went to the funeral and the young widow talked with me? SHE GOT BAPTIZED! On Thursday I got a phone call. I instantly recognized her voice and bawled like a baby when she invited me to come to her baptism. The Elders asked if I would sing for her baptism. I sand “come unto Jesus” and I think it turned out okay. I was just so happy! She was not even “my baptism” but I feel like she is a sister. Other than that, this week was super tranquil. Yesterday our Zone Leader asked us to contact as many families as we could…my comp and I contacted 52 families and 140 people in 45 minutes! 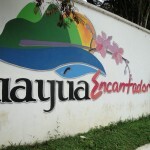 wooohooo!!! It was awesome to congratulate all of the mothers, even funnier when the Zone leaders did not believe our totals for the day. Anyways, I sure love you guys. Thank you so much for your love, support, and all that goodness. Please keep me in your prayers. We will see what the Lord has in store!